Parents spent more than three minutes of a 16-minute trip with their eyes off the road when kids were in the car. Photo courtesy of Shutterstock. If there’s one principle that needs to be observed when driving, it’s that the road must be seen to be driven. Scanning, braking, turning, merging — these actions all depend on direct observance of the traffic around you. 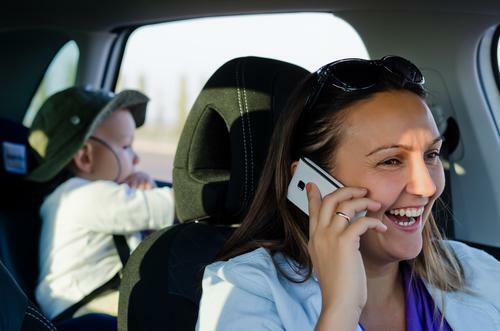 Shouldn’t it make sense, then, that parents are far more likely to get distracted by the kids in the backseat than talking on their hands-free cell phone? A new study from the Monash University Accident Research Center now confirms the risks parents have known anecdotally for years. Driving with children isn’t just slightly more dangerous; it’s a full 12 times more dangerous, according to the study. When researchers installed cameras in the cars of 12 families over a three-week period, they found talking on the phone only accounted for one percent of distractions. Distractions from children, meanwhile, accounted for 12 percent of all distractions. Over the course of an average 16-minute trip, parents that had kids present spent three minutes and 22 seconds with their eyes not on the road. “The costs of distracted driving are undeniable,” Dr. Judith Charlton, one of the center’s associate directors, said in a statement, adding, “one major and previously unrecognized distraction is kids in the back seat.” Researchers called the study the first of its kind to analyze the effects of backseat distractions on the driver. Distractions varied in their type and prevalence. The most frequent forms of distraction was drivers turning around to interact with kids in the back seat or looking at them in the rearview mirror, taking place in 76 percent of cases. Parents engaged in conversation with the child 16 percent of the time, reached into the back seat to give the child food or drinks seven percent of the time, and even played with the child one percent of the time. Of the 92 trips studied, distracted driving took place in 90 of the cases. The presence of a passenger in the front seat showed no difference in distraction level. Choosing not to use a cell phone while driving is admittedly easier than deciding not to ride with children. Often, the latter is unavoidable, making solving the problem and reducing the distraction risk all the more challenging. Charlton explained that the easiest solution may simply be securing the child’s car seat properly. Researchers found that children were in the incorrect position for over 70 percent of their studied trips. Given the added risks of driving with children, drivers should be even more aware of their sources of distraction, the team noted. “Previous research has shown that, compared with driving alone, dialing a mobile phone while driving is associated with 2.8 times the crash risk, and talking or listening while driving is associated with 1.3 times the crash risk,” Charlton noted. Previous research from the National Highway Traffic Safety Administration (NHTSA) has found distracted driving while texting to be six times more dangerous than driving while high on marijuana or intoxicated. What’s more, the fatalities suffered by teenagers for driving while texting now surpass the yearly deaths for drunk driving. Thirty-nine of the 50 states have enacted some form of a ban on texting while driving. The present study’s researchers add that their research comes on the heels of Norland College, a British nanny school, launching of Nanny Drive iQ, a driving school to teach childcare professionals how to safely drive with children.